Exclusive mixtape with classic Mr.Lif-Akrobatik collaborations and fresh new tracks giving you a vision of what's to come from the Perceptionists. There's a hot freestyle/live performance, skits, plus a bonus jam never heard before (not on the tour version of this CD). 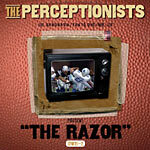 The Perceptionists are Fakts One on production and turntables with Akrobatic and Mr. Lif on the mics. This mixtape CD mixed and blended by Fakts One.